"Predicting the Turn: The High Stakes Game of Business Between Startups and Blue Chips, by Dave Knox"
Predicting The Turn is your rule book for the new game of high-stakes business. The Fortune 500 was first published in 1955, and since that time, 89 percent of the list has completely turned over. When the S&P 500 was launched in 1958, the average company remained in the index for roughly 61 years. Today, an S&P 500 company is being replaced about once every two weeks. It is no wonder that disruption and innovation are at the top of every executive agenda for the world’s largest companies. These leaders are trying to determine how to compete with a new breed of competitors that are playing the game by an entirely different set of rules. 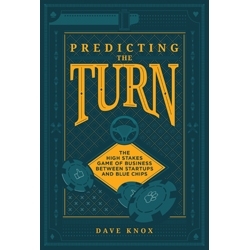 In Predicting The Turn, Dave Knox discusses the new high-stakes game of business between disruptive startups and Blue Chip companies, teaching readers how to foresee the future of their industries. As a brand marketer, venture investor, and startup advisor, Knox provides a one-of-a-kind worldview into the changing relationship between startups and Fortune 500 companies. His insight-filled book Predicting The Turn teaches the world’s largest companies how to foresee the future of their industries. One of the biggest mistakes that big companies make is underestimating their Total Available Market and where their future competitors will emerge from. Every industry is being transformed by technology. Acquisitions can infuse Digital DNA into a company’s core business – both in terms of business models, as well as human talent. By taking inspiration from a startup or innovative competitor, big companies can use their scale, brand, and financial resources to launch a new effort.